Product prices and availability are accurate as of 2019-04-19 14:33:58 EDT and are subject to change. Any price and availability information displayed on http://www.amazon.com/ at the time of purchase will apply to the purchase of this product. 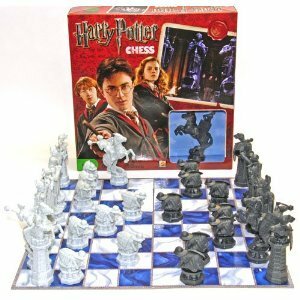 Harry Potter Themed Chess Game. Detail miniature replicas of the life-size characters that Harry and Ron battle in the film. Characters from film Harry Potter and the Sorcerer's Stone. 32 detailed, cast resin, hollow inside, chess pieces. 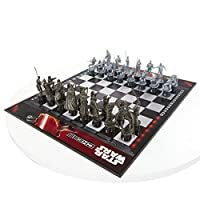 Heavy duty, glossy, white and blue swirl squares, cardboard, fold-out chess board.